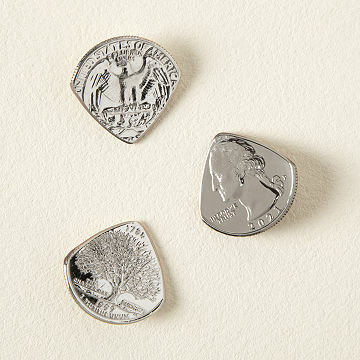 Pair your choice of state quarter with a quarter minted during a special year to create a custom pick set. Coin guitar picks have been used by musicians for a century because of their unique tonal qualities, but now they can also be a unique expression of your own time and place. That's because this pair of picks from Dustin & Stephanie Headrick is made from a pair of custom-selected quarters: one is made from the commemorative state quarter of your choosing, and the other is a quarter minted during your choice of year (from 1965 to 2018). Each coin's distinctive raised insignia gives these picks an easy-to-grip texture, so they'll stay on hand regardless of the style you prefer to strum. They create increased volume and a bright attack on acoustic instruments such as guitar, ukulele and mandolin. They can also entirely change the sound of an electric guitar by naturally reacting with the strings and pickup dynamics. Hand-honed in Nashville, Tennessee; appropriately nicknamed the "Music City." Nashville natives Stephanie and Dustin Headrick transform common cents into uncommon guitar picks. The couple started with a collection of silver quarters and half-dollars, but didn't really want to watch them sit around for 50 years and collect dust. It's well known with musicians that silver coin guitar picks have been around for a hundred years, but actually getting your hands on one is a rare thing. So, the savvy numismatists began hand-honing the coins into picks and immediately loved the tinny sound they produced. After gaining popularity at local craft fairs, they began experimenting with other materials: brass, bronze, copper, aluminum, hardwood, and even horn. To date, they've sold tens of thousands of handmade guitar picks to musicians all over the world, with many customers becoming avid collectors. Only years 1965 - 2018 available. Please note: 1975 quarters were not produced and bicentennial quarters will be used in orders placed for 1975. These picks are of great quality and look great! I haven't heard them used on a guitar yet, but I'm sure they will sound great. My son loves guitars and music.... I thought he would appreciated having these custom pics. Will buy again. Fast service! My friend loves the sound of these guitar pics. He is a professional, playing 3 -4 nights a week also composes music. He felt this was a fun way to create a new sound. My brother was very excited to receive these on Christmas morning. The history behind quarter guitar picks is wonderful and the personalized state and year made it even more special. He just received them so I can't comment on quality or durability but I imagine they will hold up well over time. I have these personalized quarter guitar picks to my father as a Christmas gift and he absolutely loves then. Got this for my daughter-in-law Christmas gift. She is musically talented, teaching piano, guitar, etc... Something she never dreamed I would give her. Looks great, sturdy and my son was excited to have something personalized! My husband thought this was a great gift.